Until this point, all our motion has been done with G00/G01 for lines and G02/03 for arcs. In this chapter, we introduce the notion of “Canned Cycles”, which allow more complex types of motion aimed at simplifying the programming of certain common operations such as drilling holes. Canned cycles are often modal just like the other motions. For example, once we select the high speed peck drilling cycle with G73, subsequent coordinates on later lines specify new hole locations where more peck drilling will be done. What is a “Peck Drilling Cycle”? A term you’ll hear a lot is “peck drilling”. This is the practice of drilling a little ways (the peck distance), back off some distance, and then going back down to the bottom to take another peck. Think of the motion as being not unlike a woodpecker. The reason it’s done is to evacuate the chips from the bore. Recutting chips is always a bad thing for tool life. The other purpose of peck drilling is improved chip evacuation. There’s only enough room down in the bore for the chips that fit in the flutes of the twist drill, and the deeper the hole, the harder it is to evacuate those chips out of the hole. Peck drilling also helps with chip evacuation in two ways. First, even a very short peck where the retraction is minimal helps to break off the chip resulting in shorter chips. Shorter chips are much easier to evacuate. Second, if the twist drill retracts a substantial distance, this helps reduce the distance the helix of the twist drill has to carry chips. One thing it that is important to avoid when peck drilling is letting the coolant or air/mist blast wash chips back down the hole. For that reason, the best peck drill cycles will not pull the twist drill completely clear of the hole. Another thing to keep in mind is most manufacturers do not recommend peck drilling for carbide drills. It increases the tendency of chipping the brittle carbide. There are some rules of thumb about when you need to start using a Peck Drilling Cycle as opposed to just plunging straight down. Most tooling manufacturers will suggest you start when the hole is 4 diameters deep. G-Wizard Calculator will remind you if you forget. As you can see, the cycles may be divided based on their purpose–drilling, boring, or tapping, whether they are peck cycles, how they retract, and anything special that happens at the bottom of the hole. For example, dwelling helps ensure a smooth bottom of hole finish and evacuates any chips from the bottom of the hole. Getting chips between the drill point and the hole bottom as the bit descends for another peck greatly increases tool wear, especially with work hardening materials like stainless steel. 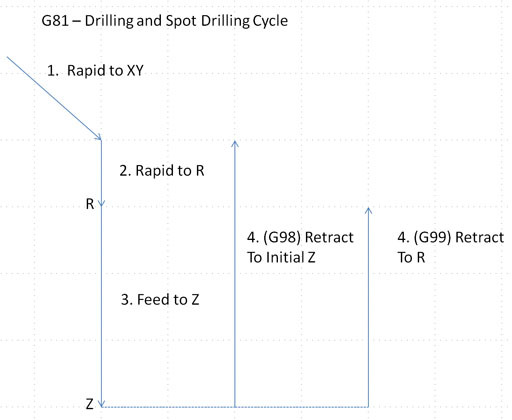 There are a lot of parameters and options associated with the drilling cycles, so let’s start with a relatively simple one: G81. G81 does no pecking and has no special operation at the bottom of the hole. It just goes down at the feedrate, and then retracts. – First, the machine rapids to the X and Y coordinates of the hole, or the corresponding pair of coordinates if a plane other than G17 is selected. For our example, those coordinates are X10Y12. – Second, the tool rapids straight down to the R position, established by the “R” word of the cycle. We came in at a Z of 1.0″. R is 0.2″, so we rapid from 1.0″ down to 0.2″. – Next we feed down an amount equal to Z. In other words, Z specifies the depth, not a particular coordinate. That depth is measured from R. So, with an R of 0.2″, and a depth (Z) of 0.7″, we are going down to Z = -0.5″. Remember to do that math carefully, as R will always be a little above material top and you have to add it to the actual hole depth to get your Z. – Lastly, we retract at rapids speed. Now retract can work in one of two ways, and is modified using G98 and G99. G98 and G99 g-codes are used to modify the retraction behavior of canned drilling cycles. If G98 is in effect (specified before the cycle such as the G99 shown above), retraction is back to the initial Z height. If G99 is in effect, retraction is to the R height. The option to retract to the original Z height using G98 is provided in case there are obstacles between the holes such as clamps or other features of the part. As mentioned, these drilling cycles are modal. That means you can just real off a bunch of XY coordinates once the cycle is initiated, and the machine will happily execute the cycle at each location. To cancel the cycle, use G80. After executing the G80, the machine returns to G00 mode. In the example above, we get 3 holes before the G80 cancels the canned cycle. By now, you’re probably thinking the water is deep, it’s cold, and it’s moving pretty fast–canned cycles are complex! It’ll seem like it until you get used to them. The complexity is there to give you all the options you need to hand a myriad of situations. There is good news though, whether you’re just trying to learn, or whether you’re actively developing and testing canned cycles in your g-code. 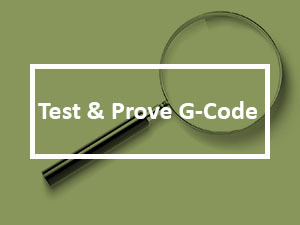 You can use a g-code simulator to help make them easier to understand and work with. 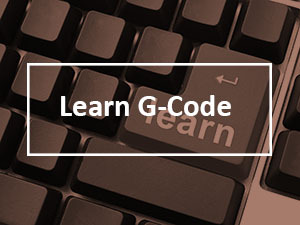 If you haven’t already, pop over to our G-Wizard G-Code Editor/Simulator and sign up. That will put a first class g-code simulator in your hands which will make understanding and working with canned cycles a whole lot easier. – It reminds us that the G99 means to return to the initial R plane after each hole. – It tells us G81 is a simple drilling cycle. – Lastly, we know the bottom of the hole is at Z = -0.5″, exactly where we wanted it. It’s really helpful to have these kinds of tools at hand when you’re trying to work with canned cycles. In the G81 example above we saw how the canned cycle is modal, so we can just keep giving XY values and drill a buch of holes. There is another approach that can be used for multiple holes assuming they have regular spacing, and that’s to use relative coordinates and repeats. G82 is a drilling cycle that doesn’t peck, but instead dwells at the bottom of the hole. This increases the accuracy of the hole depth. Once the drill reaches the bottom of hole and has finished dwelling, retraction is at rapids speeds. G83 g-code is a drilling cycle that retracts all the way out of the hole with each peck. As such, it is well-suited to deeper holes than the G73 cycle can handle. G83 also allows for dwells at the bottom of the hole. This increases the accuracy of the hole depth. What About Even Deeper Holes? To learn more about all the other techniques, check out our Deep Hole Drilling article. 1. Dig out the programming book for your controller and read the chapter on canned cycles so you can see how they work. 2. 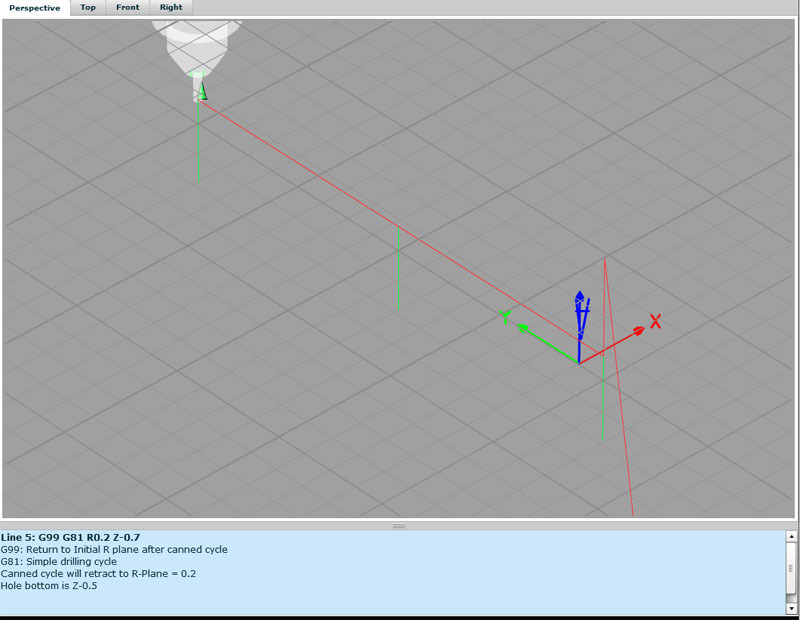 Configure G-Wizard Editor properly for your controller’s canned cycles. 3. Write some g-code that uses a canned drilling cycle. 4. 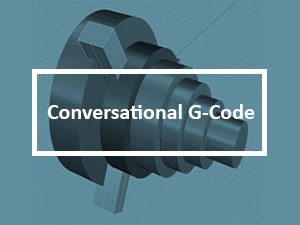 Use the G-Wizard Conversational CNC tool in G-Wizard Editor to make a g-code program that uses canned drilling cycles. 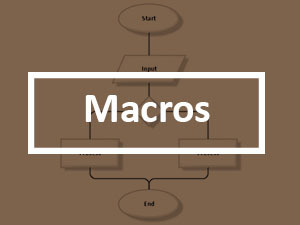 Take a look at how it works and compare to the program you wrote in #3.